Disclaimer: Since our visit to Cuba, Trump has announced rolling back some of the Obama initiatives that have opened up Cuba a bit more to America. I'm not really keeping track of that, but note that what worked for us in March of 2017 may not be applicable now. If you're planning your own trip to Cuba, you'll want to do your research about the most recent rules and regulations! It's a fast-changing subject! I do know that regularly scheduled direct flights between Cuba and the United States will continue (for now, at least), but the rules and regulations about using them.... I'm not so sure about. March 15: For Amanda's birthday this year, we decided to make a real adventure of it by heading into a territory not particularly well-known for its close ties with the United States: the fabled land of Cuba. About a year ago, for the first time in over 50 years, regularly scheduled direct flights have started between the United States and Cuba and Amanda and I figured it was about time to try one of them out. We both wanted to see Cuba before it became "Americanized." Although there are direct flights between the two countries, there are still a few extra hoops we would have to jump through. First, you have to have a valid reason for visiting--there are a dozen or so valid reasons one can visit--but merely being a tourist isn't on the approved list of reasons. However, the list is surprisingly open. There were two or three possibly legitimate reasons I could use. I wanted to blog about the experiences and tell people about the country and its people, so perhaps I could use the journalist option. I could also say I'd be there for "educational" activities. I'd be practicing and learning Spanish, after all, and just learning about Cuba itself. The simplest reason, however, was to "support the Cuban people." Seems like a generic catch-all term if you had trouble deciding between other options, and we would be supporting the Cuban people. We'd be spending money there, so we'd help support the people economically. Tell them how wonderful freedom and capitalism in America is. (Although maybe that would just be rubbing salt in their eyes.) Amanda found a whole bunch of books (in English and Spanish) that we would donate. She had other gifts and presents to hand out, but the books were the heaviest and largest items we'd be hauling to Cuba. The day before, we flew from Seattle to Miami via Los Angeles, so our morning started with an alarm clock going off at 5:30 in the morning at the hotel. 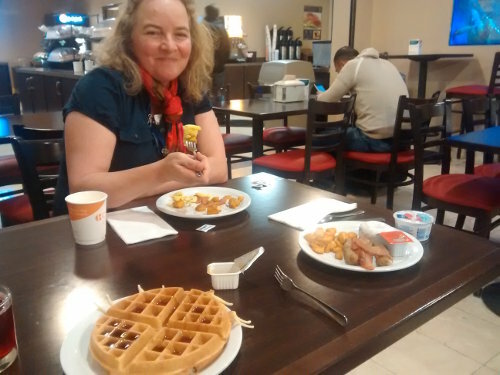 After packing everything up, we headed down to the breakfast room--the continental breakfast was included with the room--and I'm happy to report they had those waffle machines so I could make a proper waffle. It was a fairly good breakfast setup and even included bacon, sausage and eggs! After filling up, we headed back to our room to brush our teeth and grab our bags, then check out and took the shuttle van back to the Miami airport. Amanda ducks to get away from this low-flying plane at the Miami airport! Checking in for our flight was particularly challenging today. We tried to check in at one of those self-service kiosks, but it asked all sorts of new questions we never had to worry about before including whether or not we had been born in Cuba, our reason for going to Cuba, and our home address. And let me tell you, typing out a long home address one letter at a time on those screens was annoyingly slow and error prone. Seemed like it took us five minutes to get everything typed in properly before it showed an error message that summoned an agent to help. He told us that because we were flying to Cuba, we had to check in at a different counter elsewhere in the airport. All that work... for nothing?! Argh! Why didn't it give us that message the second we typed in our confirmation code?! So we headed to the new locations and once again tried to check in on those kiosks, and once again, after reaching the end, it displayed an error message to summon an agent. There were two agents currently helping other people, so we waited patiently for one of them to help for several minutes before the screen on our kiosk went back to the start page. Nooo! Apparently, it had timed out and reset to the beginning. We had to typed everything in again. For the third time. It was getting real old, real fast. Another five minutes entering data and we got to the error message again, but the gate agents were still helping the same people as before. What was taking them so long?! I was antsy to get their attention--I didn't want our kiosk to reset itself again--and waved at the agents trying to get their attention. Then one of them walked off to who knows where. Argh! She eventually came back, helping the same person as before, and I waved trying to get their attention sure that the machine would reset itself at any moment and require us to type in everything again. Anyhow, the agent fixed the problem, and then we got in a line to pick up our visas for $100 each before handing over our checked bags, heavy with books, which were whisked away out of view. With all that paperwork done, we could finally get through security and arrive at our gate. I spent the next hour walking around the D and E terminals sightseeing--all this area was new for me! Eventually, I headed back to our gate where Amanda had more paperwork for us to fill out. This paperwork was for getting into Cuba (through Cuban customs and immigration), though, not for getting out of the United States--which had been what all the forms we needed to fill out before were about. We also got our visas stamped with the official seal of approval. Just before the flight started to board, we saw an officer showing some paperwork to an agent about a guy who was being deported on the flight. I wondered what his story was, but didn't think it was prudent to ask too many questions. It wasn't a long flight from Miami to Havana in the literal sense, but it certainly is in the figurative sense! Our flight soon boarded, and we were among the first to board since we had first class seats for the 48-minute flight. The flight was uneventful. It flew over the Florida Keys--right over the 7-Mile Bridge if the maps of the route on the monitors were accurate. We couldn't see the ground too well because of cloud cover, so if the 7-Mile Bridge was down there, we didn't actually see it. Near the end of the flight, we could see land. Cuba, obviously, because what else would be there? It seemed kind of surreal to me to be so close to Cuba. Who'd have thought it possible?! This mythical land that few Americans dare to tread! The flight landed and we stepped off the plane, following signs to the customs and immigration area. At the first checkpoint, they checked my passport. Then we picked up our checked bags. I tore off the tag from my bag, but crumbled it up in my hand and kept it because I didn't see a trash can around to throw it away. Good thing I did, I suppose, because at the second checkpoint, the lady who let us through pointed at the crumbled piece of paper in my hand wanting to see it. I'm not sure why, and she didn't seem to take a very close look at it, but waved me through and I officially stepped into Cuba a few seconds after Amanda. I let Amanda do all the planning for this trip because she likes doing that sort of thing and it was her birthday--she could do whatever she wanted. =) She had already set us up with a taxi ride waiting for us upon our exiting the secure area of the airport. Before we left the airport, however, we had to get some local Cuban money. Lots of old cars to admire! The first issue was that US dollars aren't the ideal currency to be carrying around. Because of the poor relations between the US and Cuba, there's a 10% penalty for converting directly from US dollars into Cuban currency--in addition to the usual 3% conversion fee. Not wanting to pay that penalty, Amanda and I "invested" in other currencies instead. Amanda bought a pocketful of Canadian dollars while I bought a fistful of euros. Converting money twice was still cheaper than converting directly from US dollars into Cuban money. The other problem with coming from the US is that US credit cards, as a general rule, don't work in Cuba, so Amanda and I would have to carry enough cash to last us the entire trip. That's a little nerve-wracking. Usually, neither of us carry more than a couple of hundred dollars at a time and restock from ATMs as needed, but that wasn't an option here. So we estimated a worst-case scenario of how much we expected to spend, doubled it (better safe than sorry! ), then converted it into Canadian dollars and euros. We would be walking around with about $1,500 worth of cash on us. In a country where the typical worker earns about $10/day. Cuban money gets even more complicated, though, because there are actually two different currencies used in Cuba. There's the CUC and the CUP. The CUC is primarily used by tourists while the CUP is primarily used by the locals. One CUC is set to one US dollars--which is kind of ironic, I think, given that US dollars are penalized, while one CUC (or 1 USD) is equal to 25 CUP. These exchange rates don't change--they're pegged to the US dollar, so that at least makes thinking in CUCs very easy. They're essentially US dollars. Anyhow, the line to convert currencies into Cuban money was short but remarkably slow. It must have taken 20 minutes to watch the five people head of us get their currencies. Eventually, however, we made it to the front of the line and picked up our Cuban currency. We were in business! The taxi driver walked us to his car and drove us quickly and efficiently into Havana. The first noticeable thing I picked out were that the street lights had timers on them, apparently in place of yellow lights. Red lights would count down the seconds until they turned green, and green lights would count down the seconds until they turned red. I rather liked that system--there was never any doubt about how stale a green light might be! Although I wondered if it would encourage people to speed up at intersections if the light was about to change like people often do at yellow lights. As we drove into the city, our taxi driver pointed out famous landmarks along the route such as the Plaza de Revolucion where there was a giant tower and a couple of the buildings had black, multi-story outlines of heroes of the revolution including (of course) Fidel Castro. There were a lot of billboards along the route promoting Fidel Castro as Cuba's savior and one true god. A bit later, our room was ready and we dropped our bags before heading out to see the sights. Our first destination was a bookstore that Amanda wanted to hit--and where Amanda planned to donate most of the books that we brought into the country. Both Amanda and I thought Havana had a lot of similarities to Guatemala and Central America. The buildings were generally run-down and in a sad state of decay. Sidewalks were often uneven, missing or had gaping holes. There was an eclectic assortment of vehicles on the road with a plethora of 1950s US cars and newer (but still usually old) Russian cars. Most of the cars looked in pretty bad shape and a large number of them belched black diesel fumes. Although a car might look like a 1950 US vehicle, I don't think any of them use the original engines, and a lot of them seemed to use diesel. The air was thick with exhaust from the traffic although the traffic itself didn't seem particularly heavy. But mostly, we just wandered around admiring the sites. After the bookstore, we walked to the shoreline and admired the ocean waves crashing against the sea wall. We walked to a park with a statue of John Lennon--there must be a story about that but whatever it was, we didn't know it. We wandered through the Plaza de Revolucion--the same place our taxi drove by earlier in the day, but this time we could stop and take photos of the area. Then we headed back to to our casa particular where I promptly fell asleep for a couple of hours. I was so tired from lack of sleep the last two nights while flying to Miami then on to Cuba and it finally caught up with me. We lost even more potential hours of sleep due to the time change on Sunday and lost another 3 hours flying from the west coast to the east coast. So I fell quickly asleep despite it still being only four o'clock in the afternoon. A couple of hours later, I woke up. I didn't want to sleep too much in fear that I wouldn't fall asleep again until far too late at night. It was a good time for dinner, though, so Amanda and I headed out again. First we tried to visit a nearby cemetery--allegedly the second largest in the world according to our guidebook--but it had closed a half hour earlier. Then we tried to find somewhere to get dinner and settled for a place with a second-floor patio that appeared to have a French theme. Amanda ordered the ropa vieja ("old clothes")--apparently a Cuban specialty of shredded pork or something to that effect. It was better than my chorizo pizza, though! By the time we finished dinner, it was quite dark out and we headed back to the hotel for the night. I had downloaded several movies and TV shows from Netflix to my smartphone so Amanda and I watched Raiders! about a few kids who recreated Raiders of the Lost Ark, shot-for-shot during the 1980s. The amount of time and effort they put into their recreation was astonishing, but that's not what this blog is about. It was a fascinating documentary about their efforts, though, and our entertainment for the rest of the evening. Getting online was not an option. Internet service in Cuba is severely lacking. I turned on the wi-fi of my laptop just to see how many wi-fi signals it detected and in the middle of the capital city, the total count of wi-fi signals it found--both secured and unsecured--was exactly zero. Supposedly, we could get online at some of the nicer hotels, although it is relatively expensive to do so and is charged for by the hour. (The wi-fi, not the hotel! At least I assumed the hotels didn't charge by the hour... not like I asked!) It is, we hear, also not a particularly fast connection so streaming movies or TV shows probably wouldn't be an option even if we did get online. In any case, we weren't in a swanky hotel and had absolutely zero Internet access--and very well might not have any until we would return to the United States. My first view of Cuba! The taxi driver who picked Amanda and myself up at the airport. Amanda and I waiting around the patio for our room to be prepared. It was a pleasant place to relax! Amanda at the bookstore where we donated a whole bag of books! This is a typical "street sign." In this case, taken at the corner of 31st and Paseo Ave.
You gotta pay attention where you step in Cuba. Open holes, uneven sidewalks.... It can be dangerous! Amanda hangs out with a statue of John Lennon. The cemetery we wanted to visit had closed a half hour earlier... Maybe another day!